Back in 1999, Bandai launched its own portable gaming system, the WonderSwan. 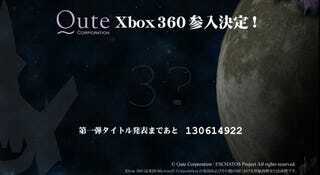 That bird's day has flown, but a WonderSwan developer is now developing a new Xbox 360 title. In 2001 and 2002, Kanagawa-based Qute Corporation worked on a hobby development kit for the WonderSwan called WonderWitch. Save for an online game, the studio has been largely quiet. Until now. The company has a countdown clock for the "ESCHATOS Project". The number 3 with a question mark is in the middle of the page. More details are expected when the clock stops ticking.